The prank was pure genius. Two boys stood on opposite sides of the road. As a car approached, the boys pantomimed picking up a rope and pulling it taut across the road. This caused speeding cars to slow down as the drivers perceived they were about to run into whatever the boys had stretched across the road. They couldn't see anything in front of them, but the boys' actions told the drivers' subconscious brains that some danger lurked ahead. Of course, there was no rope. You can watch the prank here. The drivers were reacting to the boys' actions, not reality. Customer service is often the same way. The experience is almost always amplified for good or bad by the actions of the individuals serving us. A restaurant meal can become "an amazing experience" or the "worst meal ever," depending on the rapport the server can develop with her guests. A retail shopper can become "a customer for life" or vow to "never go back," based on the retail associate's ability to listen carefully to his customers' needs. A cable company can ensure a problem is "quickly solved" or deliver "nightmare customer service" based on the technician's ability to solve a problem and make customers feel okay in the process. Somehow, many executives miss this important lesson. They understand the product or service they sell, without considering how their employees impact customers' perception. These spreadsheet jockeys know the numbers, but not the people. 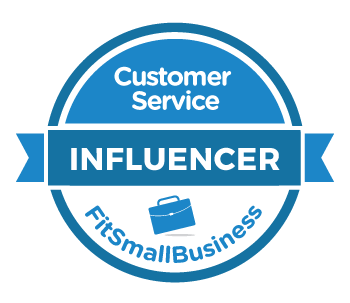 In researching my forthcoming book, The Service Culture Handbook, I've discovered that elite customer service organizations do something differently. These organizations focus on their people first. They work diligently to hire, train, and empower employees who will create positive perceptions with the customers they serve. That's because companies with customer-focused cultures understand that customer perception, not product, is the most important aspect of a company's reputation. It’s no secret that customers hate to wait. What may be surprising is customer satisfaction isn’t just influenced by the actual amount of time spent waiting. How customers spend that time is also important. People overestimate actual wait times by as much as 36 percent. In other words, waiting a little bit makes us feel like we’ve waited a bit more. The good news is companies can influence customers’ perceptions of wait times even when they can’t decrease the actual time spent waiting. Would you be interested in learning a few Jedi mind tricks to help your customers feel less aggravation, frustration, and dissatisfaction the next time they have to wait? What influences wait time perception? Let’s start with a basic overview of some of the factors that influence our perception of wait times. These are primarily directed at physically standing in line, but many can be connected to other situations such as being on hold with a call center. Much of the background data is neatly summarized in a 1995 research paper called The Experienced Utility of Queuing. Expectations. The wait time is longer than we expected it to be. Fairness. People are cutting in line. Competition. Another line appears to be moving faster. Movement. The queue is moving slowly. Line Length. We can see a long line. Boredom. Our wait time perception increases when we are bored. Unpredictability. There is no information telling us how much longer it will be. Understanding these factors can allow companies to reduce customers’ perceptions that they are waiting a long time. Disney is a master of this science in their theme parks. The Indiana Jones Adventure ride is a great example. A sign at the ride’s entrance displays an expected wait time, which is usually a slightly conservative estimate. The line is clearly demarcated so interlopers are less likely to wander in. There’s a single line (except for “Fast Pass” holders and disabled guests), so nobody gets anxious over choosing the wrong line. The line is designed to keep moving so guests feel as though they are constantly making progress. Guests are led through a series of rooms so they aren’t able to see the length of the line. They’re engaged with entertaining videos and clever displays that make guests feel the adventure has already begun while they continue to move forward. Finally, the line is designed to give guests a glimpse of the end so they get a sense that they’re getting closer. You don’t have to design an entertainment extravaganza to help your customers feel like the wait isn’t quite so long. A few simple strategies can make a big impact. Strategy #1: Provide accurate estimates. Restaurants, call centers, cable companies, and many other businesses routinely provide estimated wait times. This strategy cuts both ways. Customers are generally satisfied if the estimated wait time is agreeable and it matches (or is slight longer than) the actual wait. Customers generally get upset if they end up waiting longer than expected or the original estimate is too long. The key here is to give accurate, but slightly conservative wait time estimates. Historical data and operational knowledge often enable these fairly precise forecasts. Just be careful to check your estimates frequently to make sure they’re still accurate. Strategy #2: Provide a fair and common queue. We’ve all played the game at the supermarket where you select the line you hope will go the fastest. Another surprise from the New York Times article was that the negative feeling associated with seeing another line move faster than yours is much stronger than a positive reaction from picking the best line. The common queue or common-feeder line is a way to reduce this anxiety. It also makes it more difficult for interlopers to exploit confusion and cut their way in front of someone else. Well-trained employees can step in when it’s not possible to physically denote the line. I recently rode the cable car in San Francisco and was amazed at how well the cable car operators ensured passengers boarded the car in the order they were waiting. Knowing they were making sure the process was fair reduced a lot of passengers’ anxiety. Strategy #3: Occupy their time. Another sure-fire way to make wait times feel shorter is to keep your customers occupied or entertained. You don’t have to be Disney to take advantage of this simple principle. Some restaurants put out free coffee at breakfast to help guests warm up while they wait. Waiting rooms have magazines, television, and free WiFi. Call centers have music or messages played while customers are on hold. One of the best ways to occupy your customers’ time is through engaging them directly. Initiating conversation will make the time fly for your customer and it may even help uncover additional ways to be of service. Don’t worry if you aren’t a natural conversationalist – you can always borrow my five question technique. The previous tips can all enable you to improve your customers’ perceptions of wait times. What would happen if you could reduce actual wait times? Long waits increase aggravation and increased aggravation means lost business. Customers will turn around and leave if a restaurant wait is too long. They’ll hang up and call your competitor if they’re on hold too long. Even if they stick it out, customers may choose to take their business elsewhere if the wait was too long the last time. Conversely, shorter wait times can easily become a source of competitive advantage (Kumar, 2005). Improving a process or hiring more staff might be another great way of using service to attract and retain customers. I often write about service failures and what we can learn about them. This post is about the other side of the coin. Specifically, I want to share ways that building rapport can have an inordinate on customers’ perceptions of service quality. According to Merriam-Webster’s online dictionary, rapport is a “relation marked by harmony, conformity, accord, or affinity.” In a customer service context, this involves connecting with customers in a way that causes them to see you as a real, likeable person. Terms like rapport can be a bit squishy, making it hard to observe, quantify, and even train. One way to operationalize the definition of rapport is to count how often people mention someone by name in the comments section of your customer service survey. Will this trend hold up when you analyze your own voice of customer data? I don’t know, but it is worth a look. If rapport is highly correlated to outstanding service, why doesn’t it happen more often? One explanation might be that customer service professionals face a number of barriers that can make rapport-building difficult. Speed. It’s hard to build rapport when employees are in a hurry. Skill. Many people simply don’t know how to build rapport with customers. Sales. It’s really hard to like an overly aggressive salesperson. Task-focus. Rapport takes a hit when tasks are prioritized over service. Customers. Some customers are jerks and resist rapport. Are there other barriers that I missed? What do you see? You’ll have to remove these barriers if you want your employees to build more rapport with customers. Here are three simple steps to help your employees become rapport-building champions. Review your customer satsifaction data to see how rapport might be impacting service quality. Do you see evidence of greater rapport in your top box survey scores? 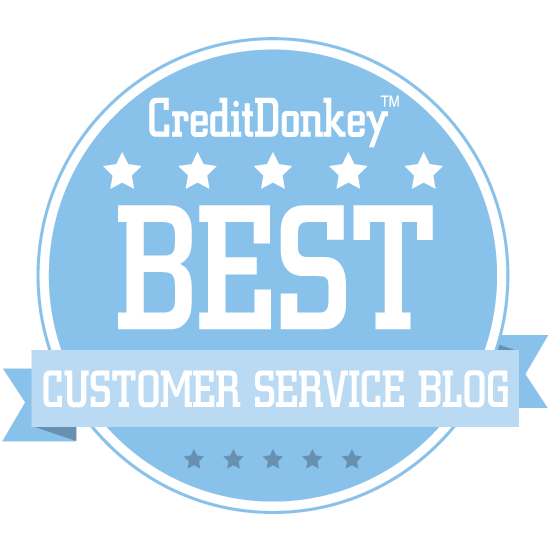 Are some employees consistently mentioned in customer service surveys while others are not? You can learn a lot by assessing the current situation before doing any tinkering. Watch your employees serve customers. Can you observe any of the barriers to rapport mentioned above? Share your observations with your employees and ask them to help you find solutions. You might be surprised at how many good ideas your team can come up with. You’ll also notice they are more like to implement ideas that are their own. In many cases, employees just need a little bit of training to help become more adept at building rapport. One of my favorite exercises is called the five question technique. It’s based on the idea that having a short list of conversation starting questions at the ready can make anyone seem like a rapport-building pro. Ask employees to brainstorm a list of five rapport-building questions. Have employees practice using these questions with customers. At least one of these questions will be effective in almost any situation. You can learn more about this and other rapport building tips in my customer service idea bank. Anyone who has served customers face-to-face can attest to the fact that customers don’t read signs. Take a look at this example from a deli. The sign above the bin clearly reads Recycle (in two languages! ), yet many customers have ignored the sign and used it to throw away their trash. So, why don’t customers read and follow simple signs like this one? The root cause of this problem stems from employees and customers viewing the experience through different frames. As I noted in a recent post, customers often see things differently. They put out the recycling bin so they know where it is. They put up the sign. They put out the trash bin too (15 feet away, not pictured). They empty the recycling bin and have to sort out the trash. They direct customers to the recycling bin when asked. Now, let’s look at the customers’ perspective. It only took a few minutes of observing customers to see what led people to put trash in the recycling bin. I observed customers stand up, scoop up their trash, and quickly scan the area for a trash bin. The recycling bin was closest to the deli’s tables, so it was the first bin most customers saw. The bin looked like a trash bin at first glance. It was gray and stood by itself, so customers naturally approached the bin thinking this was where trash goes. This thought was reinforced when they peered inside the bin and saw a mixture of trash and recycling. Deli customers are in a slight hurry to leave once they finish their lunch. Being in a hurry can narrow our focus and lead to a phenomenon called inattentional blindness that causes normally obvious things to disappear from view. Hurried customers fixated on a solo gray bin filled with trash could easily overlook the recycling sign. Customers can and will make mistakes like putting trash in the recycling bin. I even devoted the second chapter of Service Failure to the notion that the customer is not always technically correct. However, it’s our job as customer service professionals to make it easier for customers to be right. 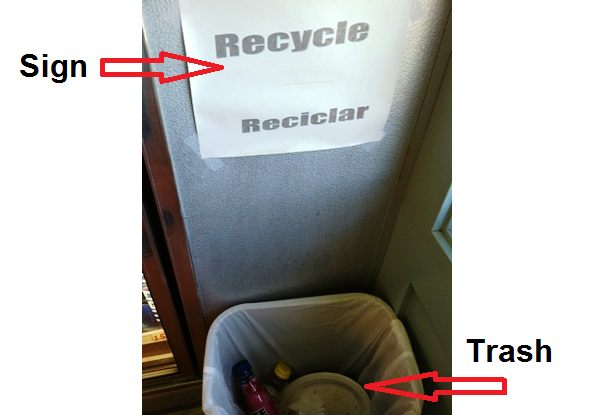 Put the recycling bin and trash bin side-by-side so customers see both. Use a blue bin for recycling to differentiate it from the trash bin. Add the "chasing arrows" universal recycling symbol to the sign. Customer service employees often find themselves getting annoyed, frustrated, or exasperated with customers who don’t read or follow signs. However, taking a step back to observe customer behavior can often reveal simple solutions that will yield better results. I chuckled as I imagined what someone might think if they didn’t realize that Tuesday Morning was the name of a store. Yes, that scenario seems a bit far-fetched, but it’s a good reminder that customers can often view a situation in different or even unexpected ways. This is a topic I’ve blogged about before. Two years ago, I shared a post about a sign taped to an ice cream cooler that either advertised a nice selection or the worst flavor imaginable (Seeing things from the customer’s perspective). This time around, I’ll relay a story from a friend of mine plus share a few strategies I use for gaining customer insight. A friend of mine recently posted an update on her Facebook page complaining that she had been refused an appointment at her hair salon. Apparently, she had been a no-show for an average of 1 in 9 appointments, so the hair salon finally decided to turn away her business. From the salon’s point of view, no-shows cost them money since that appointment slot would otherwise have been filled, so it made sense to cut loose an unreliable customer. However, I doubt the hair salon considered my friend’s perspective when they made their decision or when they delivered the message. Predictably, she was quite angry to be abruptly told she was no longer welcome. It also made her remember the poor service she had received on her last visit, where she had previously forgotten about it because overall she really liked the place. Her post on Facebook drew many supportive comments and offers to refer her to another hair dresser. Teach empathy. The ability to empathize with another person comes from having a relatable experience, but customer service employees often have difficulty relating to their customers. Through proper training, employees can learn techniques to see things from their customers’ point of view (see 5 Ways to help employees empathize more). Dig deep into survey data. 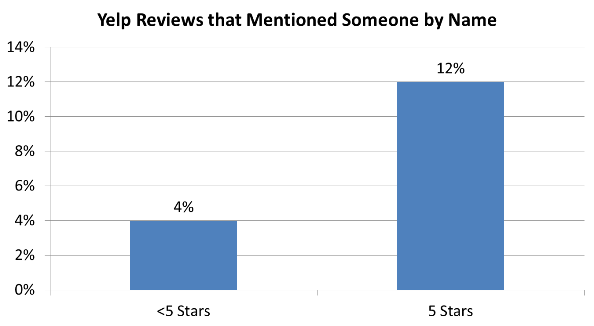 The problem with a lot of customer survey data is it’s presented in aggregate, but those averages don’t tell the full story. For example, a client mined their survey data and discovered that one particular problem accounted for the overwhelming majority of customer dissatisfaction. Look for icebergs. It’s easy to dismiss strange feedback as an isolated incident involving a confused and disoriented customer. However, in some cases this feedback may be just the tip of the iceberg. A favorite technique of mine involves digging deeper to see if there’s a systematic problem (see What the FAA can teach us about icebergs).